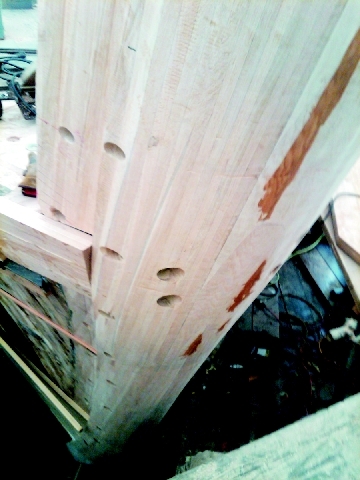 Building stuff, especially boats, with wood is much like a religious calling; once you hear the call, there’s no turning back. Those who’ve heard the call will not suffer fools willingly, so when I decided to conduct some white oak adhesion and shear testing and report the results in Epoxyworks 31, skeptics and believers alike took to the internet wooden boat forums-and had no problem speaking their minds! Having healed from the pummeling I took in some quarters, I’m back again to report the promised follow-up test results. This round of testing involved cycling the samples in our environmental huts. I moved the samples back and forth from a 100°F/90% relative humidity (RH) environment to a 100°F/15% RH environment. The samples would become essentially saturated in two to four days then dried in a similar time frame. 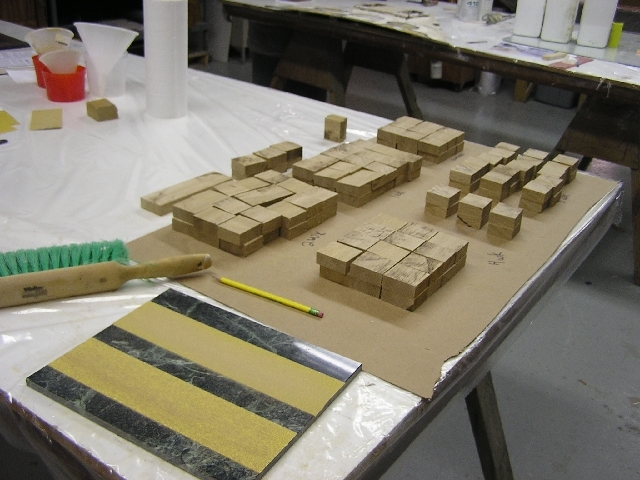 Four sets of samples were conditioned following this pattern for one, two and three weeks and tested at the end of each week. The last sample set was cycled for a total of six weeks where for the last two weeks they spent four or five days getting wet and three or four days getting dry over 14 days. This was done to try to really torture the epoxy bonds before testing took place. 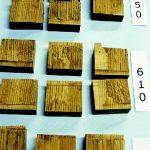 The samples were cut from the same exact stock as the first round of testing and prepared such that the grain was all running in the same direction. 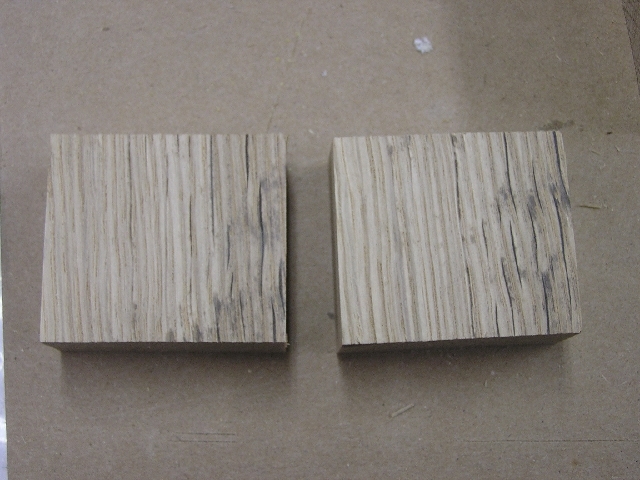 Here are two raw sample pieces showing the sawn surfaces before sanding to 80-grit. 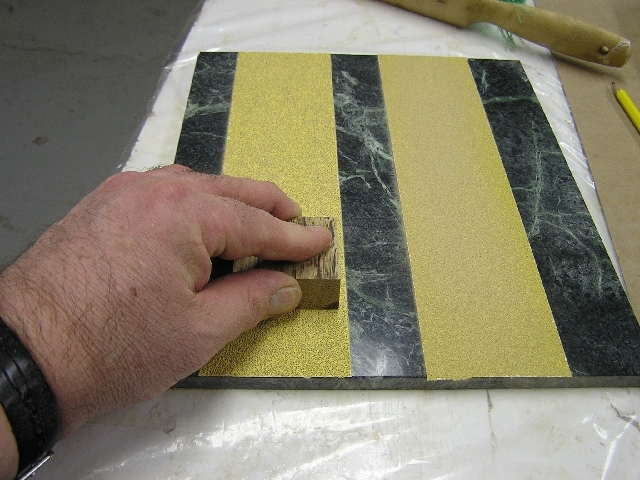 All the surfaces to be bonded were sanded with 60-grit then 80-grit on a marble tile to ensure flatness. All the surfaces to be bonded were sanded with 60-grit then 80-grit on a marble tile to ensure flatness. This is the finished sanded surface. Before glue was applied, each surface was also wiped with an isopropyl alcohol pad. Building four sets of samples with 15 in each set plus a control set with 9 samples required a lot of prep work. In addition to the bonded samples we also built a solid oak sample to test with each round of samples, and a small block to track moisture content along the way. The study again included the same three epoxy systems— G/flex® 650, Six10®, and WEST SYSTEM® 105/205 as the first round of testing. The summary of the test data is shown in the table below. All values shown are in psi and represent the average ofthe number of samples (in parenthesis) used to calculate the data sown. The moisture values represent the moisture content as a function of weight. Let’s discuss the data. 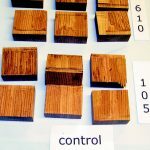 To begin with, if you refer to the first article, the values for this control set are well below what we got originally—including the solid oak data. 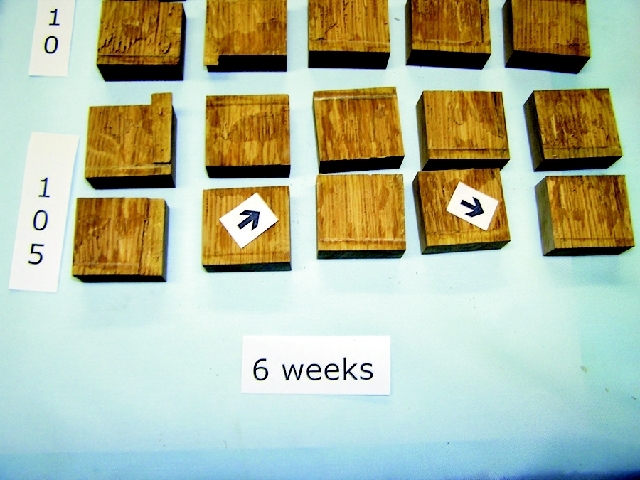 Given that the samples for both rounds of testing were cut from the same white oak timber we can only conclude that there must be differences in grain orientation and density along the length of the timber we used. 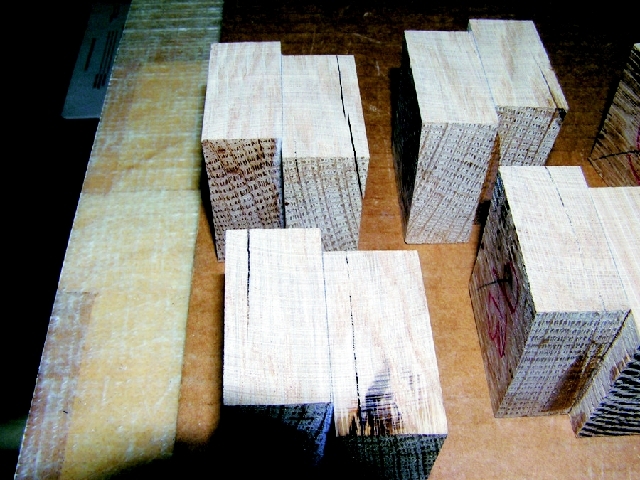 Still, regardless of the lower values, every sample failed the wood—there was no cohesive failure of the glue line. As you can see, all the samples above failed 100% wood. 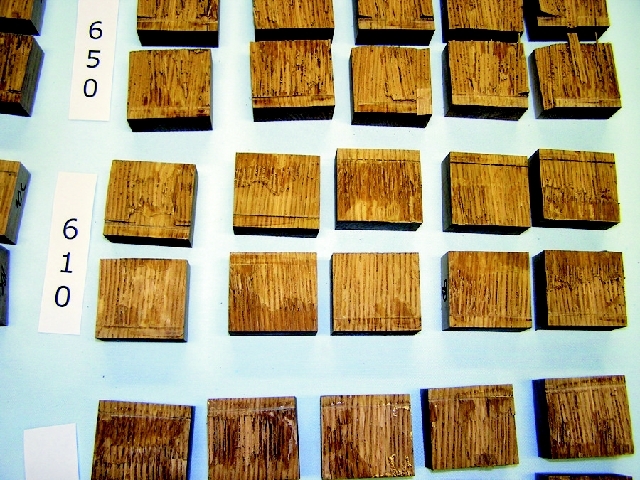 The uppermost block in the 650 photo (far right) is the solid oak. The little block with red markings is the moisture block. There is very good consistency in te average results from wich we conclude the values represent the shear strength of the oak. If that is indeed true, then wy do the solid oak samples have higher values? 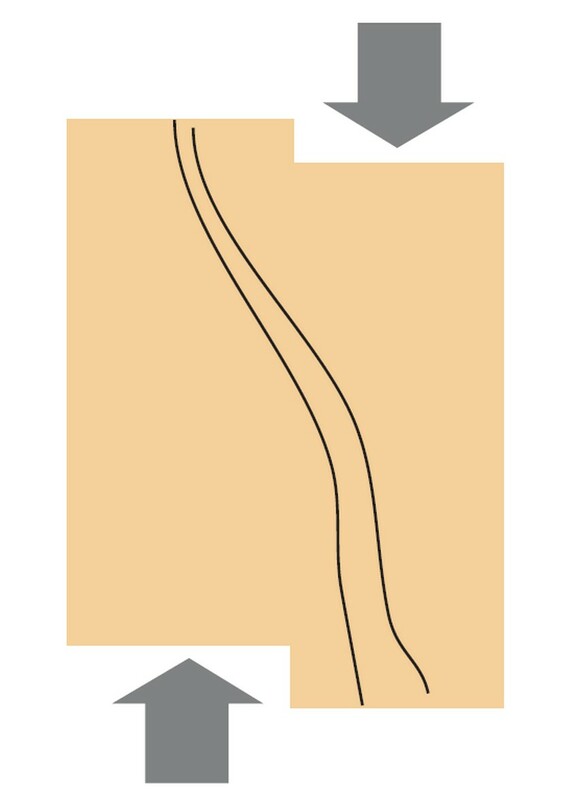 As shown in this diagram, each oak sample has a grain that passed through the straight line sheer plane. 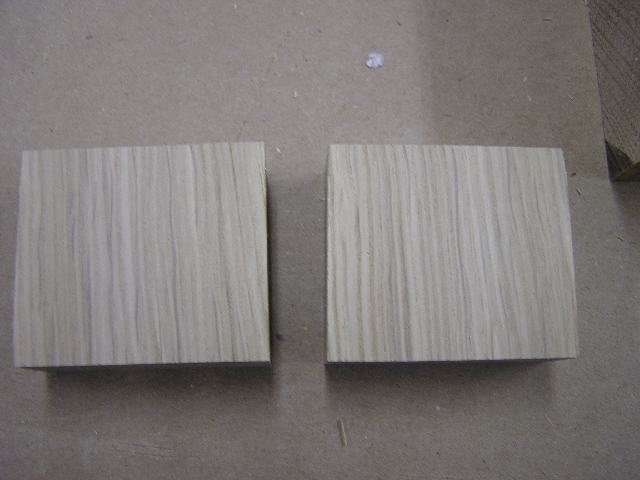 Each solid oak sample has grain that passed through the straight line shear plane. This grain structure, not present in any of the glued samples, effectively increases the area of the sheer plane which results in a higher value. We couldn’t reach a definitive answer as to why the first round produced larger average values, other than possible variations in density along the length of the stock the samples were taken from. The first, second and third weeks of environmental cycling produced much the same results. 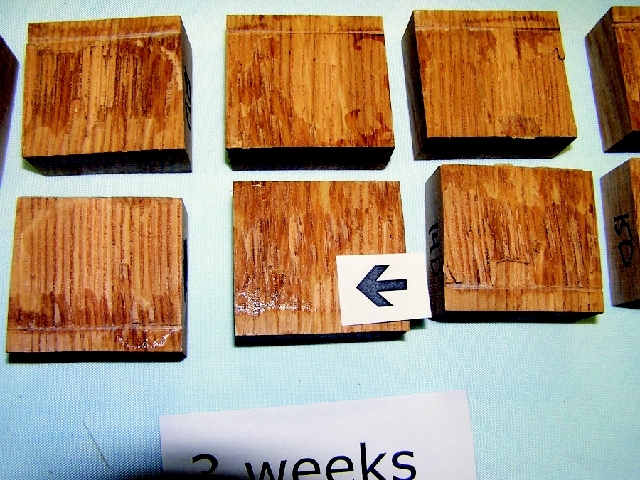 Although the sheer strength values all dropped a bit, every sample again resulted in 100% wood failure as shown below. Every sample resulted in 100% wood failure. The results of the first week are shown in the top row, the second week in the middle row and the third week in the bottom row. Samples glued with 105/205 are in the 1st column, Six10 in the 2nd column and G/flex 650 in the 3rd column. Because we hadn’t seen any big changes through the first three weeks of cycling, we decided to let the last set go longer as I’ve already described. 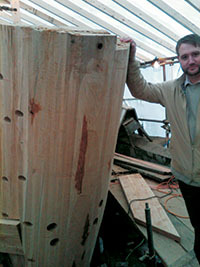 We wanted to really induce some stress and movement in the oak and by extension the glue joint. As the data reveals, we did see some significant changes in the shear strength values. Still, even with the lower values we still saw 100% wood failure/0% cohesive failure of any of the epoxy systems tested, and that is also quite significant. Let’s look at some photos. 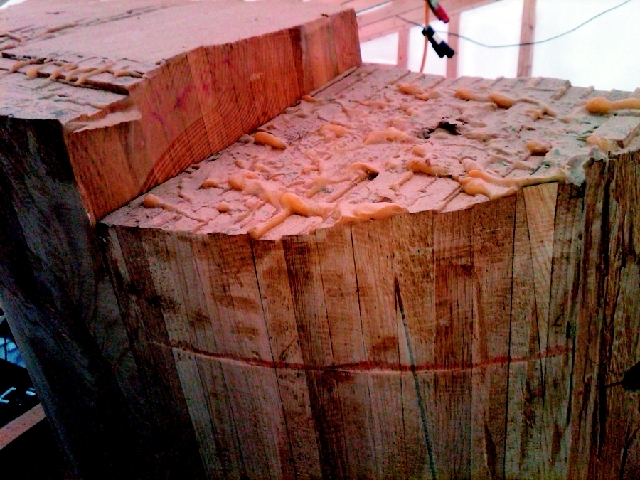 Here we see some of the damage to the oak blocks after the sixth week. We can also get an idea of the affect grain dive can have in these samples. Do not confuse the saw marks on the ends for the grain. The arrow is pointing to some shiny epoxy found in a three-week 105/205 sample. Close examination showed that it was not a cohesive failure-both matching areas were shiny, which indicates a void. This sample was not included in the average. The arrows are again pointing to shiny glue areas indicating a void. The area of the void was large enough on the #4 sample (l-r) that it too was excluded from the average. The effective area of the void on #2 was deemed insignificant and so it was included in the average. Interestingly, even though the average strength of this set of 105/205 samples was 729 psi, there was still no cohesive failure of the glue line. No surprises here-both the Six10 and G/flex 650 failed the wood extensively after six weeks of accelerated environmental cycling. These samples gained 16% moisture each time they sat in the hot humid environment and dried to a level 2.11% below the original moisture content coming out of the dry hut. The moisture content was 1.59% above the initial room temp/ambient humidity value at testing. The original control MC block which had been dried to -4.44% for testing sat out at room temperature in our shop here in mid-Michigan for the entire six weeks and gained back 0.77% moisture during that period. We see from the results that the average shear strength of the samples increases as the flexibility of the epoxy system increases. Tensile elongation of the systems tested are: 105/205 3.4%, Six10 7.9%, G/flex 650 32.7% and the respective flex modulus of each are 4.61 E+05, 3.51 E+05, and 1.56 E+05. A high tensile elongation and low flex modulus are good measures of flexibility in an adhesive. We are convinced that the reason the results show us the strength trends is directly due to the adhesive’s flexibility or toughness. 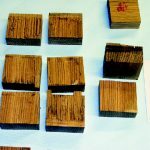 As the wood is tortured going through the environmental cycling, the cells of the wood get damaged and a more rigid epoxy will force the failure sooner than a flexible one. Because the fibers are weakened from movement due to wet/dry cycling, the more flexible the glue system the more forgiving the effect on the wood fibers. Keep in mind I’m talking about structural adhesives-3M 5200®, for example, may have an elongation of around 300% but it is not a structural adhesive and cannot be used below the waterline. In conclusion, this study has shown that white oak and epoxy construction is plenty strong and should be considered a perfectly acceptable choice in wooden boat construction. We have been recommending WEST SYSTEM epoxy in these applications for years. As with any glued structure made with wood, regardless the species, but in this case specifically white oak, the key to longevity is to keep the wood dry. In any laminated structure, like the stem pictured on the next page, keeping the wood fibers dry is of primary importance. 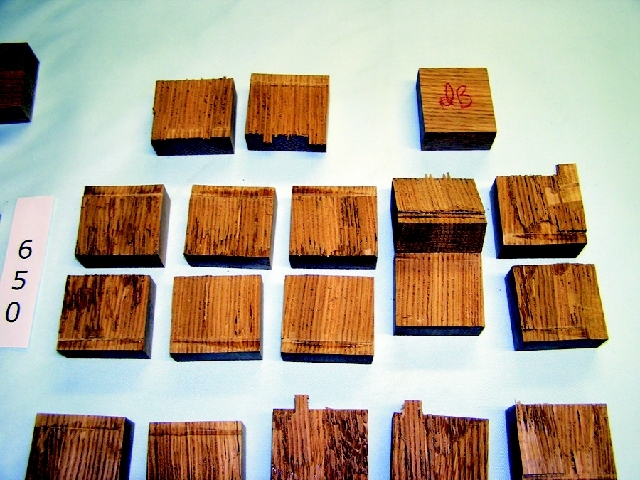 The 105/205 test sample would have continued holding strong if not for the influence of the environmental cycling on the oak. 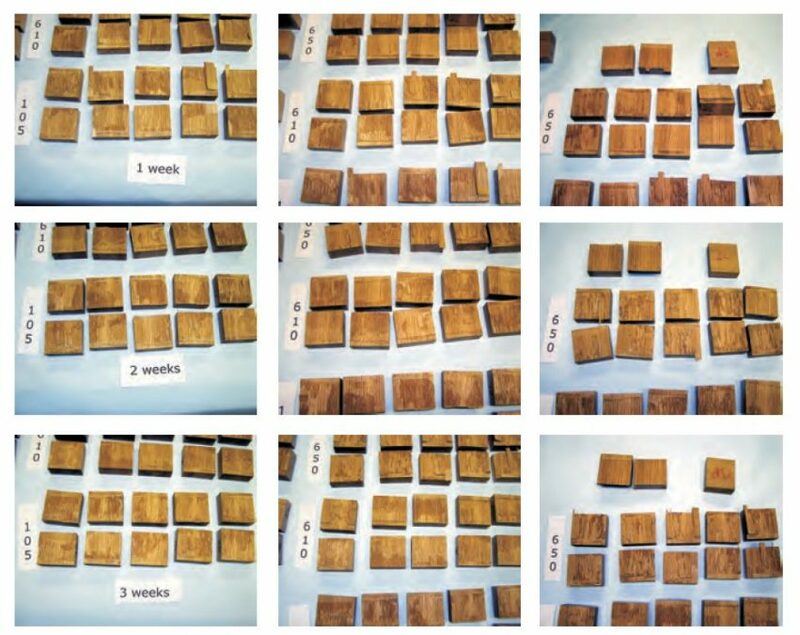 Now that we have developed the G/flex 650 and 655, based on these results, I would recommend these products for any critical wood application that is highly stressed. We have come to these conclusions given that we saw a drop in the strength of the solid oak sample and since we’ve seen only wood failure throughout the sample population. The folks at Boothbay Harbor Shipyard conducted an in-house test program using G/flex® and white oak and based on the results built the largest stem lamination I have ever seen using any adhesive system. They were confident the G/flex system would meet or exceed their requirements for this project. Note the number of laminations and the squeeze-out at the top. 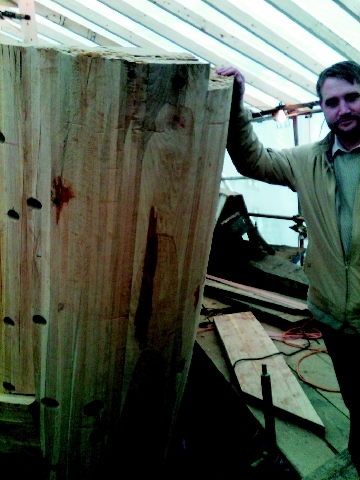 Boothbay Harbor’s large stem lamination.